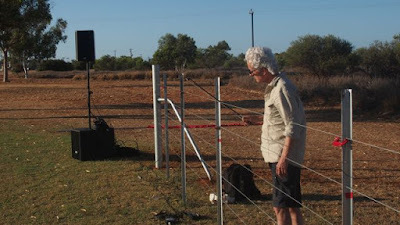 I arrived at the point of developing my own noise making contraption somewhat organically, via a series of related pedally projects that became noisey and invited discussions of pursuing outcomes that are specifically noisey. As is often the case, I am curious about trying to build projects that invite public intervention and interaction. As always, there a number of creative endeavours that I have seen other people execute over time that have parallels with or influence my own ideas. Some of these I am more particularly connected with, and some of them have been brought to my attention via discussions with others. I‘d like to take this opportunity to tip my hat to a few creatives who turn me on and to introduce some great art to others. Perhaps the closest parallel comes courtesy of legendary Australian left-field composer, Jon Rose. Most known for his playing of fences in which he takes a string bow to outback fence lines, Rose has a broader body of work that embraces a range of violin variations and wacky wavelengths. 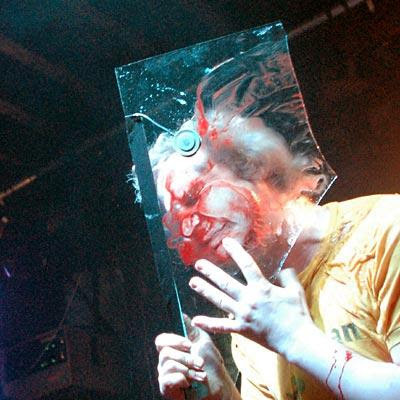 I first encountered Lucas Abela in a sweaty, seedy Newcastle pub as part of a ‘This is not Art’ festival (http://www.thisisnotart.org/) more than a decade ago. Suffice to say it was an evening of high spirits and alternate realities into which was tipped this screaming wildman who appeared to be hooked up to a life support amplifier that made him bleed rather than assisting his health. I had walked into a den of vibrating noise, flying spittle and blood. That moment will be forever etched (or incised) into my psyche. Somewhat of a creative genius, Lucas Abela has gone on to pursue a range of complex, technical, dynamic and poetic sound producing devices. These often function via layers of noise altering effects that are variously triggered by actions of audiences. A large number of these use the commonly understood mode of a pinball machine as an interface for the general public to both make and experience outcomes. One of my favourites is his pentagram shaped pinny, Balls for Cthulu, that features a suite of electric guitar necks as the bumper edges of play. You can see this one and a bunch of other wonderful variants in the video below, from a presentation at Palais de Tokyo titled Temple of Din, in 2015. Temple of Din - Palais de Tokyo - Do D!sturb from Lucas Abela on Vimeo. Gamelan Wizard, a collaboration with a number of Yogyakarta’s gamelan masters, presented at MOFO festival, Hobart, 2015. Gamelan Wizard Mofo 2015 from Lucas Abela on Vimeo. This is quite a recent heads-up from a muso buddy. 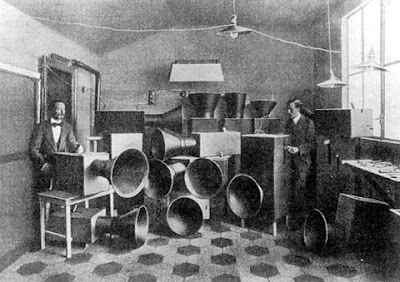 The term intonarumori describes a particular type of instrument created by Italian futurist Luigi Russolo. The Futurists were a bunch of artists of all flavours, working early in the twentieth century who witnessed technological developments such as the car and the aeroplane that changed the shape of humanity forever. Luigi and his buddies latched onto the significance of these moments and wrote manifestos and made art that particularly emphasized what they saw as new understandings of speed, technology, youth and violence. In this particular instance, Luigi was keen to make an instrument that he thought would imitate or imply a sense of the industrial city that he was immersed in. He made the instruments in a variety of forms and even wrote a specific manifesto called Art of Noises (manifestos really were much cooler back in the old days). Since his time, many others have looked back upon Russolo’s work, recreating their own take on the instrument and it’s potential. Here’s a tasty little of vid of the legendary Mike Patton dipping his tow in the intonarumori pool.